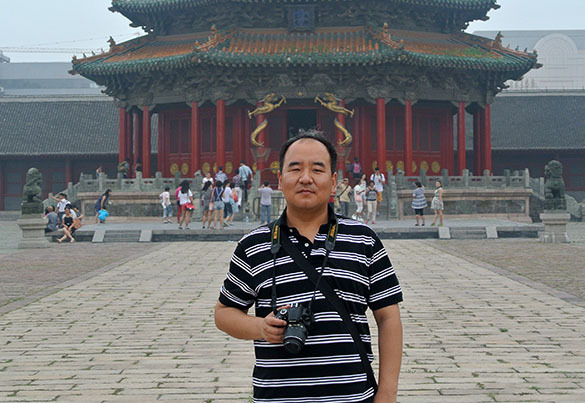 Three years ago I had a short and painful trip to China to meet my new colleague and friend Yongli Zhang (Department of Geology, Northeastern University, Shenyang). The China part was great; the pain was from an unfortunately-timed kidney stone I brought with me. Nevertheless, I got to meet my new colleagues and we continued on a project involving hard substrates in the Upper Carboniferous of north China. 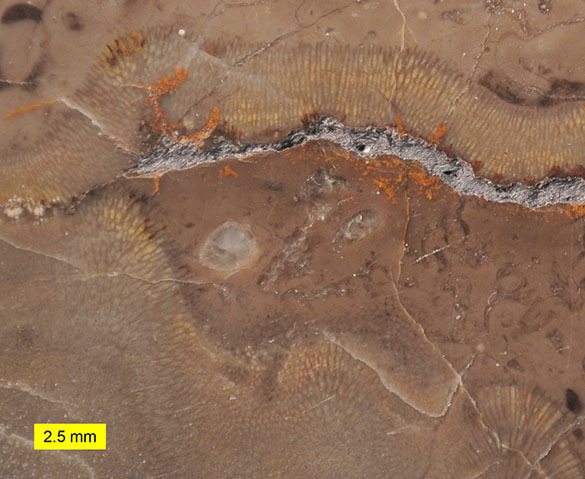 Above is one of our most important fossils, a chaetetid demosponge from the Benxi Formation (Moscovian) exposed in the Benxi area of eastern Liaoning Province. 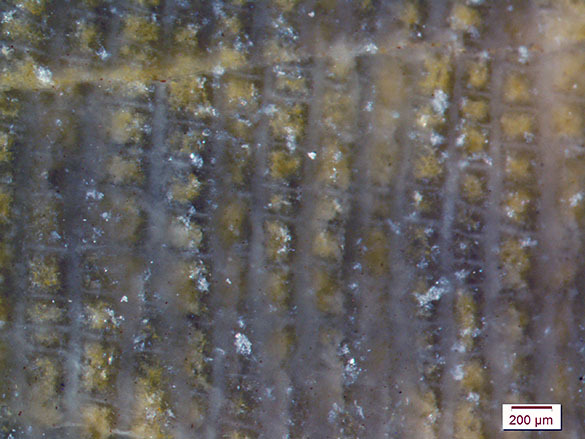 We are looking at a polished cross-section through a limestone showing the tubular, encrusting chaetetids. This month the paper on these fossils has at last appeared. This closer view shows two chaetetids. 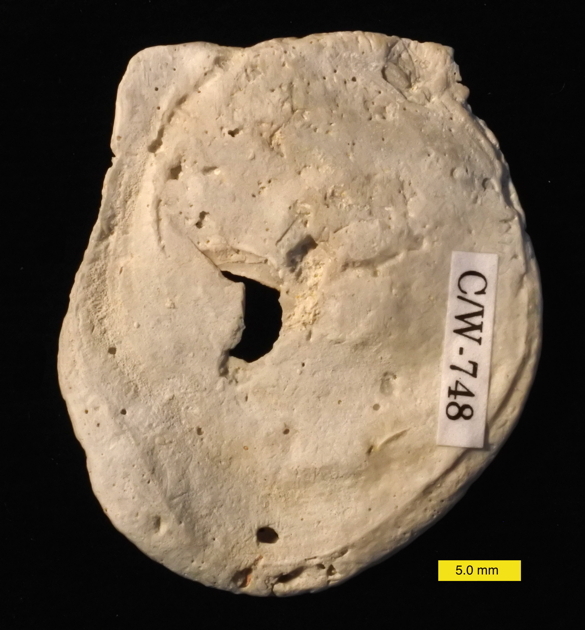 The bottom specimen grew first, was covered by calcareous sediment, and then the system was cemented on the seafloor. After a bit of erosion (marked by the gray surface cutting across the image two-thirds of the way up), another chaetetid grew across what was then a hardground that partially truncated the first chaetetid. This little scenario was repeated numerous times in this limestone, producing a kind of bindstone with the chaetetids as a common framework builder. Here is the closest view of the chaetetids, showing the tubules running vertically, each with a series of small diaphragms as horizontal floors. 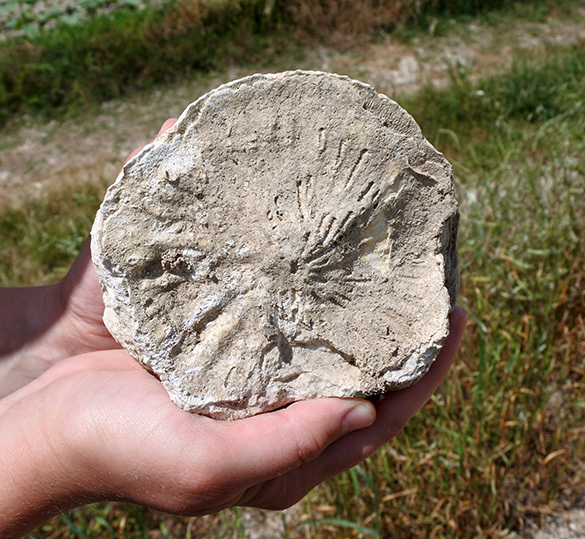 Last week’s fossil was a chaetetid, introducing the group. They are hyper-calcified demosponges, and the classification of the fossil forms is still not clear. Their value for paleoecological studies, though, is clear. 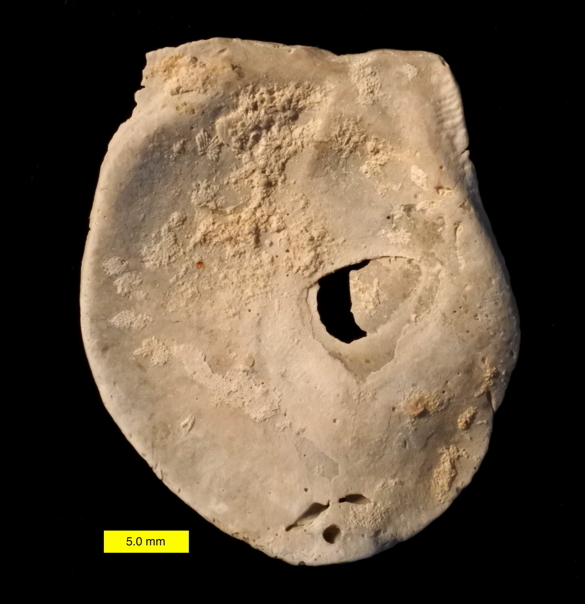 This particular chaetetid from the Benxi Formation preferred a shallow, warm, carbonate environment, and it was part of a diverse community of corals, fusulinids, foraminiferans, brachiopods, crinoids, bryozoans, gastropods, and algae. Such hard substrate communities are not well known in the Carboniferous, and this is one of the best. Gong, E.P, Zhang, Y.L., Guan, C.Q. and Chen, X.H. 2012. The Carboniferous reefs in China. Journal of Palaeogeography 1: 27-42. Zhang, Y.L., Gong, E.P., Wilson, M.A., Guan, C.Q., Sun, B.L. and Chang, H.L. 2009. 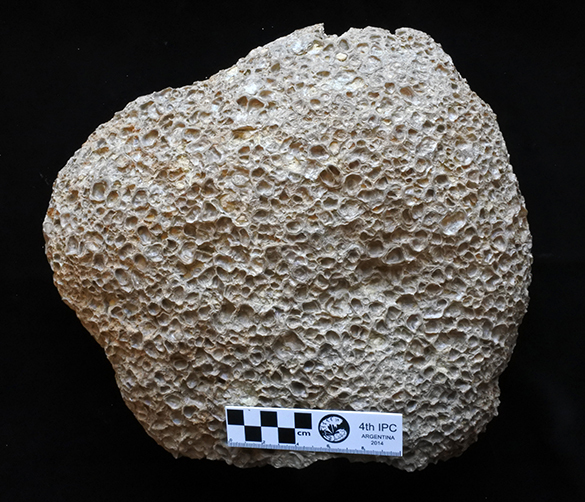 Paleoecology of a Pennsylvanian encrusting colonial rugose coral in South Guizhou, China. Palaeogeography, Palaeoclimatology, Palaeoecology 280: 507-516. Zhang, Y.L., Gong, E.P., Wilson, M.A., Guan, C.Q.. and Sun, B.L. 2010. A large coral reef in the Pennsylvanian of Ziyun County, Guizhou (South China): The substrate and initial colonization environment of reef-building corals. Journal of Asian Earth Sciences 37: 335-349. Another close view of the above hole on the other side of the valve. 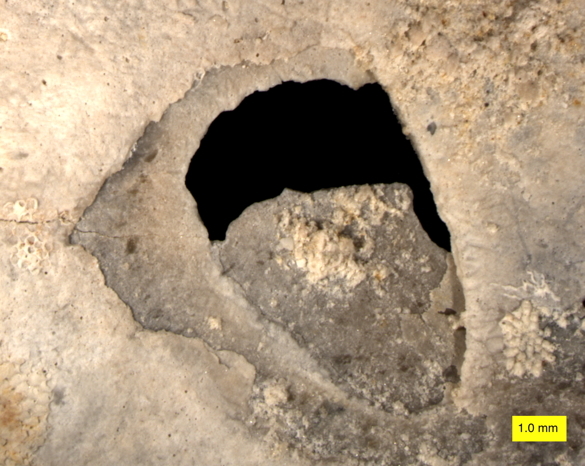 It appears that these holes have been produced by some hard object punching through, spalling away the edges. This is what some predators do to shelled organisms to break them apart. Pether (1995) named the “ballistic trace” resulting from stomatopod shrimp predation as Belichnus. Cadée and de Wolf (2013) extended the range of trace makers to include seagulls. In both cases the predators essentially “spear” the shell, with the ensuing hole looking rather squarish and jagged. 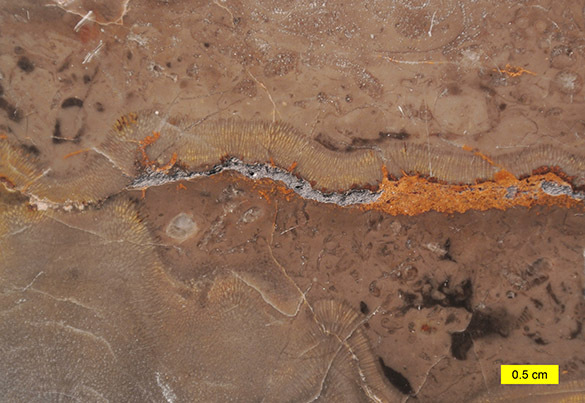 This is one of the “fracture-shaped bioerosion traces” in the architectural analysis of Buatois et al. (2017). In our Cretaceous examples, the culprit was most likely some type of stomatopod (a large, diverse and long-lived group) smacking its way into the oysters through the thin right valve. Striking the muscle attachment would be the quickest way of forcing the shell open to reveal all the oysters goodness. 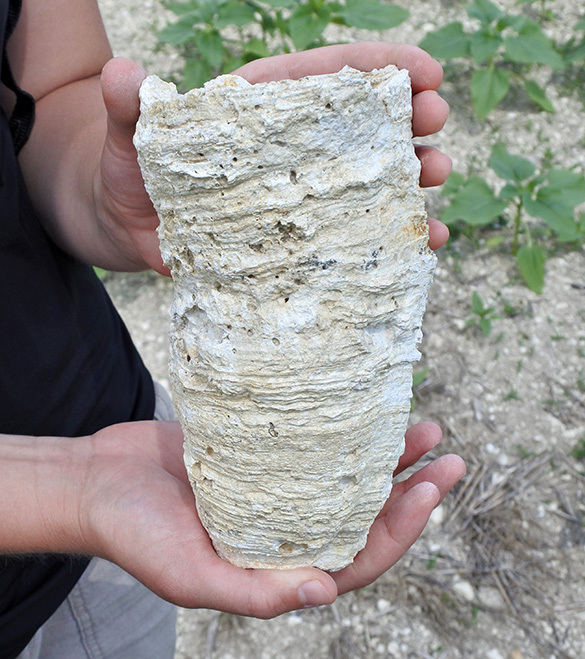 The previously oldest example of Belichnus in the fossil record is Oligocene (David, 1997), so this occurrence extends the range back to the Late Cretaceous. That’s not a big deal because the ichnotaxon (trace fossil formal name) is relatively young and those who would look for it are very few. Its stratigraphic range is still maturing. Update: Katherine Marenco sent this great video of mantis shrimp in action, including a “smasher”. Windy, warm, and dry is a good recipe for wildfires, and that has been the norm for Montana this year. For example, from June 1 through September 4, Missoula received 2.07 inches of precipitation, less than half its average rainfall for that period. Most of those two inches fell by June 13, early in the fire season. The average daily temperature since June 1 has been 68.9°F, or 3.3°F higher than normal. 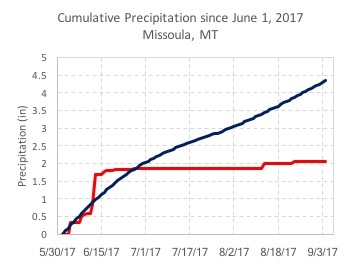 Cumulative precipitation in 2017 since June 1 for Missoula, MT (red) compared to average (blue). The total acreage burned according to Inciweb is a little over 1 million acres. Wildfires are common in western states, but this has been a particularly bad year. The area burned is about three times the size of Wayne County, OH. Size comparison between Wayne County, Ohio, Rhode Island land area, and the 2017 burned area in Montana as of 11 Sep 2017. 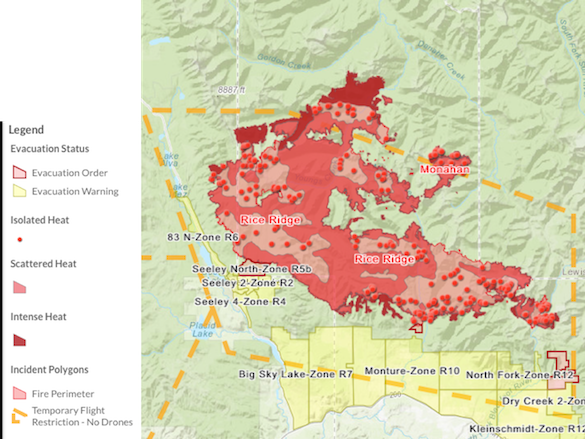 The Rice Ridge fire is one of the largest fires in Montana right now, with 135,355 acres burned as of Monday morning. According to Inciweb, It is 8% contained and has 891 personnel devoted to it. This fire has also been long-lasting; it began back on July 24th from a lightning strike. Missoula is the nearest city, but the communities of Seeley Lake and Lincoln are much closer to the fire. Officials in Lincoln, MT have been making evacuation and fire-fighting plans. Glacier National Park, already with over 16,000 acres burned from the Sprague Fire and the Adair Ridge Fire, added one more active fire to the list on Saturday when a human-caused fire over the border in Canada spread into the northwest corner of the park. The Elder Creek fire has burned 211 acres in the USA so far, but it is considered low priority given its remote location. The Park recently lost the historic Sperry Park Chalet, built in 1914, to the flames. With warm, dry, windy conditions expected to continue in the short-term, the fire damage for Montana and other western states is likely to increase. The stratigraphy here is very simple and well delineated by generations of geologists. All the students need to do is collect fossils. They don’t know much about them yet because the course has just started, so their collections will be the basis of ongoing preservation and identification projects. 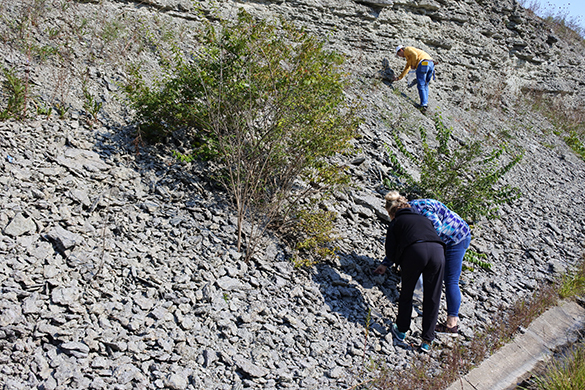 Here we see Meredith Bruch and Victoria Race (below) finding goodies, while Fox Meyer climbs up the talus pursuing fabulous fossils. 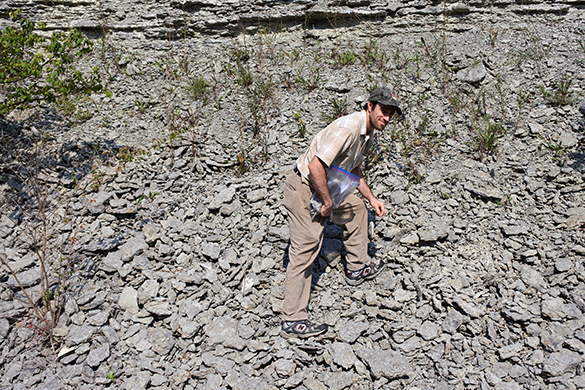 Our geological technician Nick Wiesenberg went along as a driver and an ace fossil collector with an excellent eye, which I learned about when he helped Team Minnesota last year. 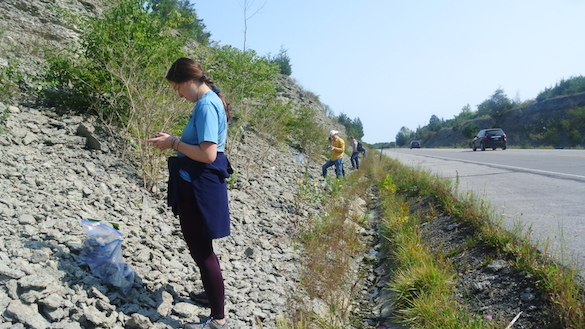 Ann Wilkinson enjoys the wonders of roadside geology in the Midwest. Here’s a nice representative slab Fox collected of the fossils at this location. Brachiopods, bryozoans, and bivalves dominate the fauna. 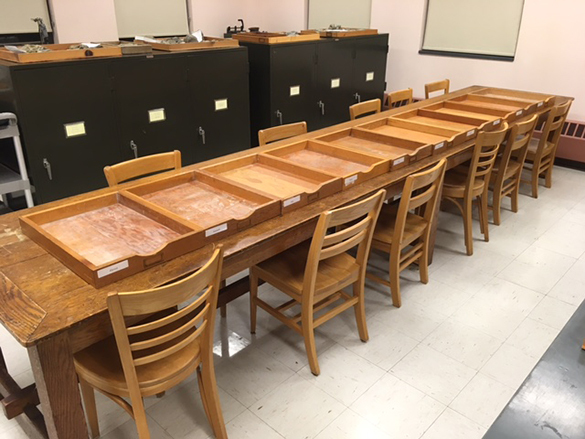 Every student had a tray awaiting him or her on return to Wooster. And the students did their work. Now each needs two trays. They will begin this week washing, labeling and sorting their specimens. Then they start identifying, using among other sources the excellent Digital Atlas of Ordovician Life and Cincinnatian Strata websites. 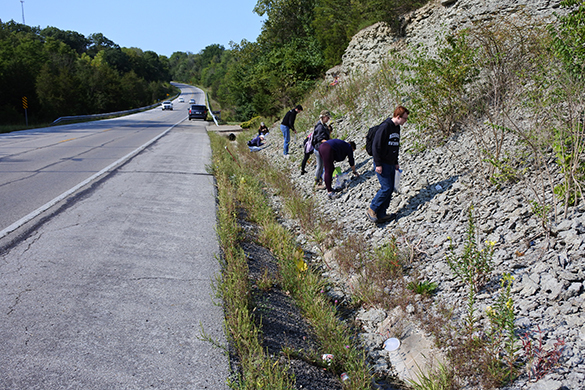 As a bonus, below is part of the 2007 Invertebrate Paleontology class on the same outcrop. Some alumni may recognize themselves, even though they are in classical paleontological poses. The cone itself is the right valve of these sedentary bivalves. The capping valve is the left, as seen here from the top. (Right and left make little sense unless you think of their more traditional bivalved ancestors.) Note that this valve has a reticulate, almost lacy pattern to the shell. 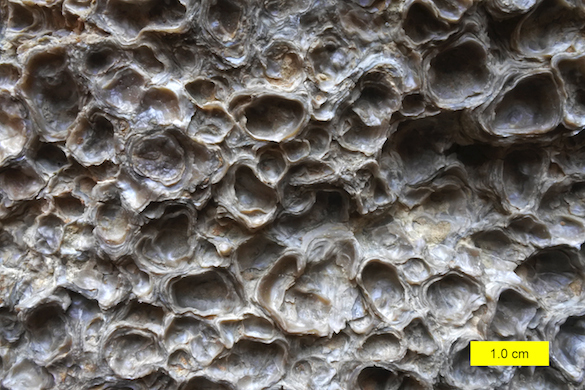 Rudists were filter-feeders like most bivalves, but they may have also supplemented their nutrition with photosynthetic symbionts in their mantle tissue. 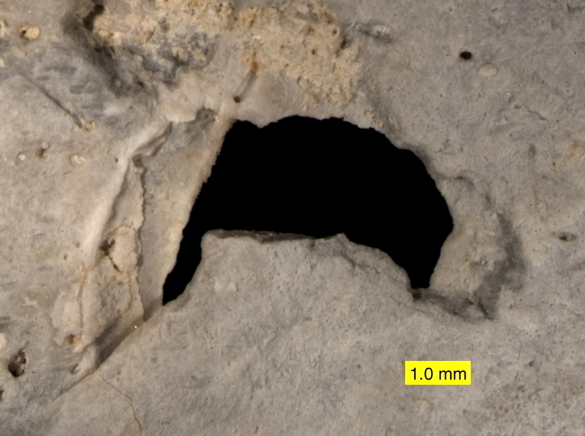 The holes in the top valve may have allowed sunlight to hit the upper mantle. This stratigraphic chart, courtesy of Platel et al. (1999) via Paul Taylor, shows the Maurens Formation at the top of the Campanian in southwestern France. 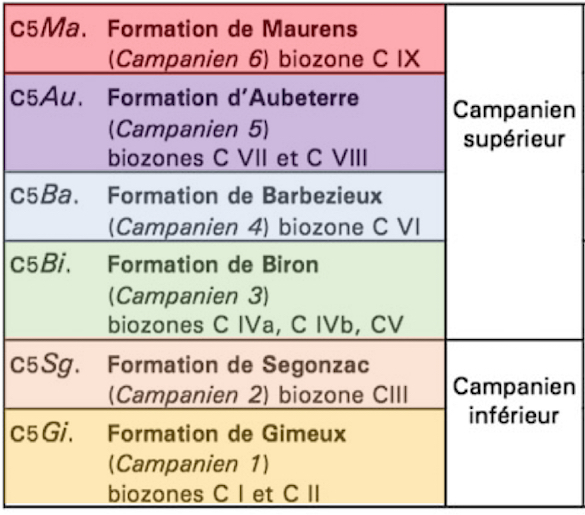 Our primary Campanian work in SW France is with the three units below (the Biron, Barbezieux and Aubeterre formations). 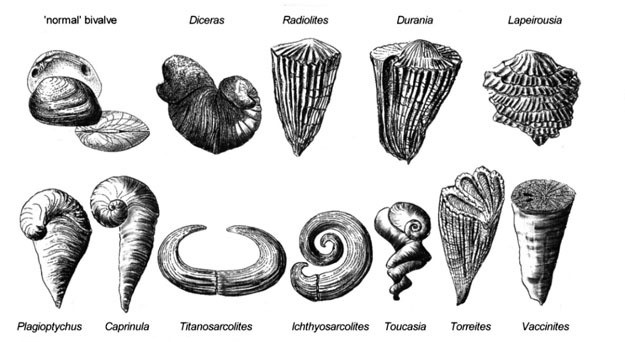 A typical heterodont clam is in the upper left of this diagram; the rest are elaborate rudist clams. In the lower right is a drawing of the type of rudist photographed above. 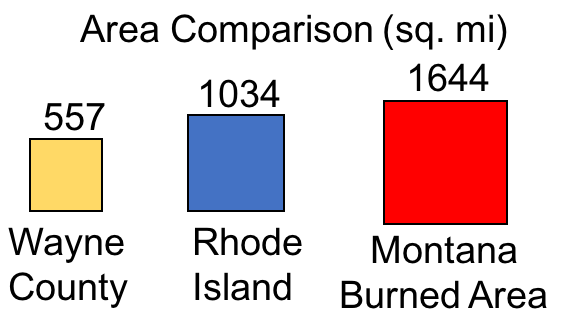 Diagram from Schumann & Steuber (1997). Rudists flourished in Cretaceous seas right up until the mass extinction at the end of the period. They are often characterized as reef builders, but most were probably living on soft sediment substrates, like our friend here. Gili, E., Masse, J.P. and Skelton, P.W. 1995. Rudists as gregarious sediment-dwellers, not reef-builders, on Cretaceous carbonate platforms. Palaeogeography, Palaeoclimatology, Palaeoecology 118: 245-267. Platel, J.-P., Faugeras, P., Mauroux, B., Spencer, C., Charnet, F., Célerier, G., Harielle, B. and Jacquement, P. 1999. Notice explicative, Carte géologie France (1/50 000), feuille Thenon, Orléans, BRGM, 128 p.
Schumann, D. and Steuber, T. 1997. Rudisten. Erfolgreiche Siedler und Riffbauer der Kreidezeit. Städte unter Wasser-2 Milliarden Jahre.-Kleine Senckenberg-Reihe 24: 117-122. 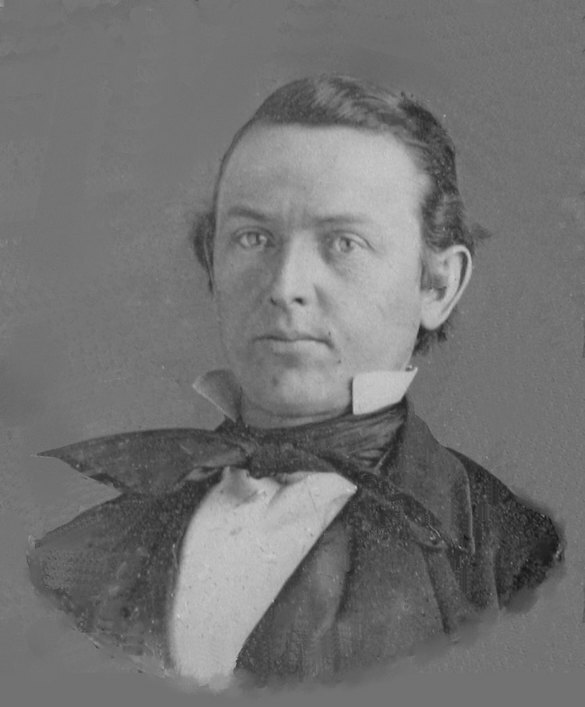 Steuber, T., Mitchell, S.F., Buhl, D., Gunter, G. and Kasper, H. U. 2002. 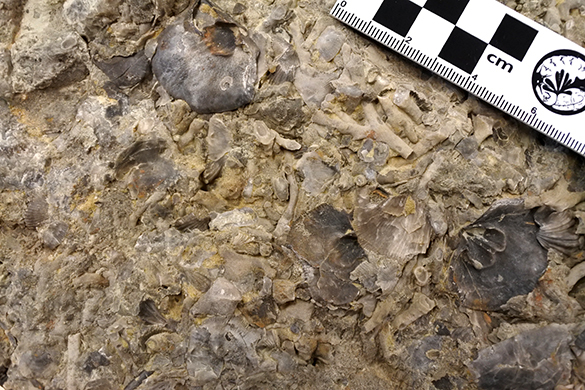 Catastrophic extinction of Caribbean rudist bivalves at the Cretaceous-Tertiary boundary. Geology 30: 999-1002. I start my Invertebrate Paleontology classes with an unknown fossil given to each student. I pick something I have enough examples of so that everyone gets the same species. As their first assignment, the students are asked to identify their fossils as specifically as possible using whatever method works, short of asking me or my teaching assistant. Once they’ve identified their specimens, they are then asked to provide an age and likely location of collection. The beautiful fossils above were the unknowns for this semester’s class. Do you know what they are? 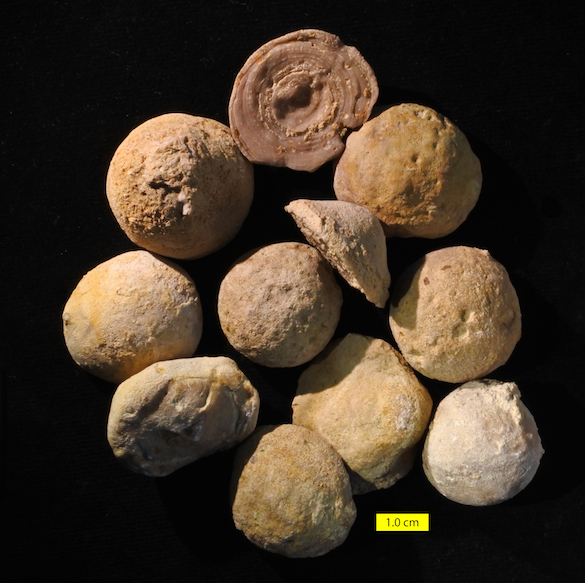 These are specimens of the trepostome bryozoan Prasopora falesi (James, 1884) from the Decorah Formation (Katian, Upper Ordovician) of Decorah, Iowa. 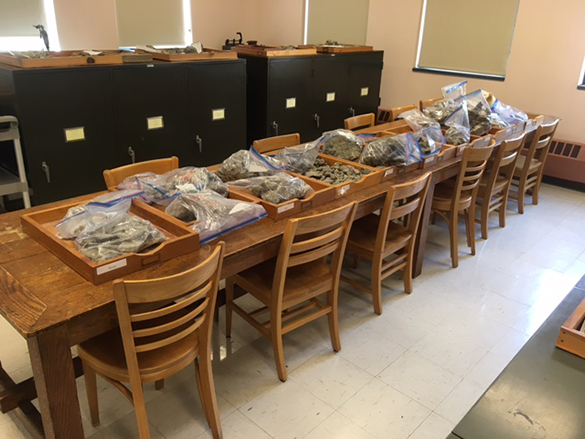 They were collected by Rachel Wetzel (’17) as part of our Team Minnesota expedition in 2016. Four of my current students figured this out to the species level! Most knew we were in bryozoan territory.